After six hundred sticky miles, crossing three Mason-Dixon state lines, I cry uncle to the road. From the rear of the trailer I survey the evening's surroundings. Unnervingly secluded, with an impenetrable scrub perimeter, the 10-acre parking lot has even less charm than it's likeness in Baghdad or Chernobyl. What pavement remains is buckled and heaving, the missing chunks long since pulverized under the weight of 80,000 pound truck and the Florida sun. Weeds burst from every crack that'll bear them, tracing the fractures of the next to go. The truck stop guide's recommendation for this place conjured up visions of an interstate oasis. The guide book's missing cover would have revealed the description to be a decade outdated. The only light comes from the dirty, Southern moon. In the shadows of the hulking shell of a former truck wash bay I try to remove the outer layer of three day's grime. Everything mechanical or valuable inside the concrete cavern is missing. Pinched off water pipes, looking like they'd been bent by hand and worked back and forth until they snapped, appear hastily stripped away – either by the former owner or urban recyclers. Only bird nests and graffiti remain to absorb the echoes from the freeway a hundred yards west. The line from Steve Earle's song, Guitar Town, describing the sound of steel belts humming on the asphalt could've been written from this spot. The ammonia-like stench of dried, human urine does little to dissuade me from my brushing my teeth. Around me, a variety of litter proves that I'm not the first to call this place home for the night - or longer. Worn out tires, broken pallets and a mess of indistinguishable grease-covered flotsam – likely jettisoned under the cover of darkness, lay slumped in piles. Broken bottles, a mound of partially folded clothes and an armless Barbie block me from walking further. I see headlights and hear a couple more truckers lurch their rigs into the place. Likely out of time on their HOS clocks, I imagine them staring in disbelief as visions of a hot shower and an air conditioned coffee shop vanish for the night. Though there's room enough to park several hundred rigs on the lot, the dozen or so of us circle our wagons in groups of two or three. There's safety in numbers. My tooth paste tube falls open end down, into the dirt. There's only one, barely-squeezable smidgen remaining. I do what I can to pick and blow at the crud and the rest goes into my mouth. With the last swig from a warm bottle of water and a quick baby wipe shower I'm ready for bed. Places like this repulse most people - even scares some. Not me. I seek them out. As long as I can remember I've had a strange fascination with the seedy side of society. Abandoned buildings, overgrown homesteads, urban blight and decay, all have a hidden story. Lying in my bunk tonight I'll wonder about how this place came to be. What was it like in its glory? What caused its demise? Were the clothes left behind by a transient family looking to lighten the load as they aimlessly passed through on their way to anywhere but here? A friend describes me as having "sand in my shoes" – meaning I'm destined to wander; to explore. Driving cross country I get to see many places like this. Maybe that's why I became a trucker? The next time a run brings me through these parts I will stay here again. 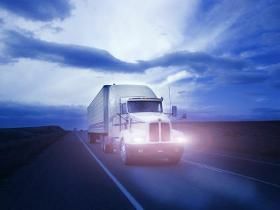 Commercial trade, business, movement of goods or money, or transportation from one state to another, regulated by the Federal Department Of Transportation (DOT). My first full solo week of trucking started out well but didn't continue that way for long. I also saw some very strange sites along the way! After a lot of close calls and important lessons learned, I'm starting to get the feel for driving truck and learning to relax and roll with things. My first few days of my trucking career are off to a great start and I'm out on the road with my trainer. Everything is so new, everything is a first. What's A Tough Day Like In The Trucking World? Nothing could be more exciting than climbing behind the wheel of a rig for your first run ever as a professional driver! Here's how it went for me. Life on the road is challenging, and drivers are on tight schedules. But this was one of those days where I made a mistake that made things even worse! Every truck driver fears a family emergency happening when they're out on the road. It's a helpless feeling, and there's little you can do to prepare. Some Days Are Better Than Others. Some Are Best Forgotten. It seems like life on the road throws you one curveball after another sometimes. This winter has been tough, with some parts better off forgotten. Here's one trucker's story about living the highest of highs one day and the lowest of lows the next. Life on the road is a roller coaster ride.